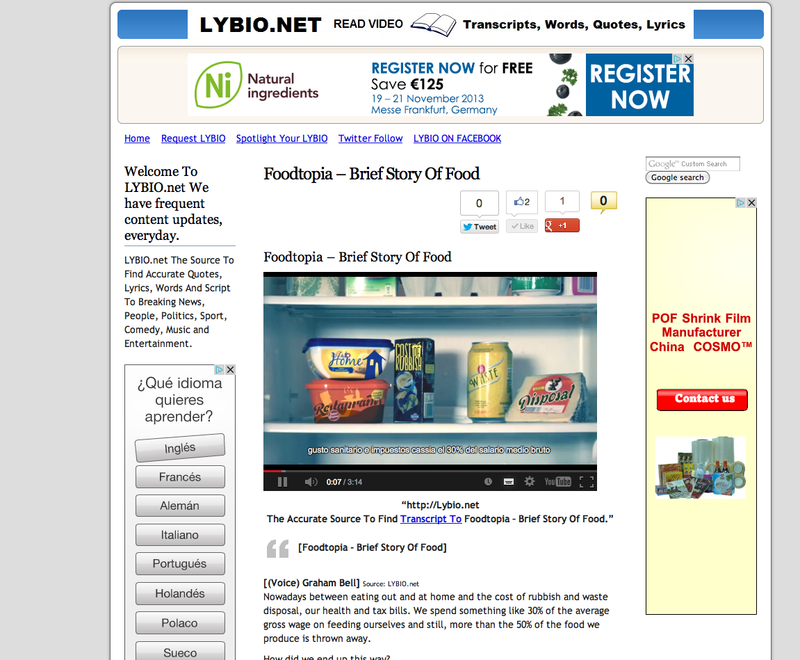 Lybio.net it’s a web that transcripts all kind of videos, books, quotes…Now they have our video on his side with all the transcript ready to be read! Nowadays between eating out and at home and the cost of rubbish and waste disposal, our health and tax bills. We spend something like 30% of the average gross wage on feeding ourselves and still, more than the 50% of the food we produce is thrown away. For over four millions years we ate like our primitive ancestors, in other words whatever came to hand in our surroundings. It wasn’t until the industrial revolution that we changed our traditional diets and dove headlong into the hectic rhythm of the city. The lack of time is what made us give up our control over our diet to industry. But so far industry has been unable to produce commercially the dishes our ancestors survived on, so instead a new kind of fast-food was invented and we became Americanized. Our diet changed drastically as hundreds of fast food chains sprang up everywhere, selling a new kind of food where the packaging is more important than the content. And in this new food contains mysterious ingredients, that we’ve never tasted before, like preservatives, flavour enhancers, additives, sweeteners, nitrates, stabilizers… emulsifying agents, antibiotics, MSG, antioxidants, Sulphites and thousands of different colourings. A new food tyrant was born: the supermarket which in its quest for added value made us believe that protein is meat. So we stopped eating wheat and vegetables feeding them to the animals, the same animals that later we would find in our plates. And with our higher meat consumption and our dietary imbalances, obesity has become a pandemic, and cardiovascular diseases have become a part of the family. And this meat creates methane, a gas which is almost more lethal than the all the CO2 generated by the world´s traffic. And so we arrive to the present day, where obese and starving people share the same planet. Where half of the food produced for our consumption is systematically trashed. Some in the field, due to over production and market logicistics, some in the supermarket and the rest in our houses. Imagine the ecological footprint this industry is leaving on our Earth. Besides being responsible of 30% of energy and 70% of fresh water total world consumption, food together with obesity is the reason nowadays of 50% of all kind of cancers. Moreover, 46% of all illness and up to 60% of deaths are related to the diet. On top of that, the food system generates social exclusion of less affluent people. if all the food costs were internalized in its market price, the average family could not afford it. This is the real cause of our crisis. (Food chain and health systems amount together to 25% of GMP). Governments and public administrations are accountable for public health, environmental quality and social integration. Food technology to change the current diet. Engineering to recover local agriculture, food processing and distribution for social development and community well being. We tried it and we did it.